ARP Ashigara — Japanese Tier VII cruiser. A Heavy Cruiser of the "Fleet of Fog". Modeled after the Imperial Japanese Navy's 3rd Myoko-class cruiser, Ashigara. She is equipped with a specialized harpoon-cannon, replacing the Super-Graviton Cannon unit. Her Mental Model "Ashigara" has a warlike personality and does not think matters over carefully. Ashigara acts as one of the "Secretaries" in the "Student Council of the Fog", along with Haguro. 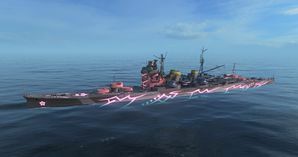 This warship has been specially designed for World of Warships, and is modeled after Ashigara as she appears in "ARPEGGIO OF BLUE STEEL -ARS NOVA- Cadenza". Ashigara is a powerful being in "Arpeggio of Blue Steel" manga and its Ars Nova anime adaptation, with enormous speed, numerous matter annihilating weapons, and a protective field that is impenetrable to any weapon developed by humankind. However, so the game does not turn into "World of ARP Ships" with a few insignificant human targets cowering in the background, the developers have declined to provide her with her true complement of abilities and weaponry. ARP Ashigara performs exactly like the standard Myoko in the game (but without the ability to equip camouflage), and that means that she shares the same play style as regular Myoko. You can refer to the article on Myoko for her performance appraisal. Her armor is quite weak, and her large citadel makes her vulnerable to AP shells. A well landed battleship salvo can potentially remove the majority of her health, and taking a page from Ashigara and just carelessly charging into the heat of battle is not recommended for any cruiser, but especially so for her because of her squishiness (and because she lacks the aforementioned impenetrable protective barrier). But she also has the powerful 203mm guns that are standard for the Japanese heavy cruisers with low shell arcs, reasonable AP and powerful HE with high fire chance, giving her a powerful offense that can devastate cruisers and burn down battleships. She receives the formidable 61cm torpedo with long range and potent warheads (but which are unfortunately neither homing, supercavitating, nor equipped with corrosive warheads) in two triple mounts on each side, though their limited rearward arc can limit their offensive potential. Her high speed and low detection range can be exploited to disengage when the fighting becomes hotter than you would like. While she has a reasonable AA complement and can function as an effective AA support ship when fitted with the right Equipment and Skills, she is better utilized as an offensive vessel, operating with the fleet or in cruiser squadrons to destroy cruisers and destroyers and harass battleships. ARP Ashigara is eager to battle, and guided by a decent captain she can be a potent force on the battlefield. All the pros of the standard Myoko. Does not take up port slots. No modules to research as she is fully upgraded. Visible to other players who have enabled the "Arpeggio" filter in their ship carousel. Comes with free Captain's Skills Points (depending on the event). Skills can be customized for her, as captain is specific to this ship. Special unique announcer (voiced by her voice actor from the Ars Nova series). All the cons of the standard Myoko. Captain cannot be transferred to ships of other nations. Voice notifications are in Japanese. Does not come with overwhelming firepower, speed, submergence, Klein field, or "harpoon cannons" of Ashigara in Ars Nova. As a premium ship, ARP Ashigara doesn't have any upgrades to research. As this ship is basically a copy of the tech tree Myoko, the following recommended commander skills for maximum effectiveness are the same. However, as it is a copy, players can experiment with different commander skill builds. Again, premium Damage Control Party is recommended in case the player finds their rudder knocked out in a precarious situation. Defensive Fire is recommended for players with an anti-air build and Hydroacoustic Search for those looking to counter and or hunt enemy destroyers. As this is an ARP ship, the ARP Ashigara cannot mount camouflage. As this ship is basically a copy of the tech tree Myoko, the following recommended signals for maximum effectiveness are the same. However, as it is a copy, players can experiment with different signals combinations. Ashigara's Mental Model, and captain in the game. Ashigara as she appears in Ars Nova. Ashigara as she appears in the game in Yokosuka Port. In 2038, a mysterious fleet of warships, who have lurked around the world in the decades decades before, went on the offensive against humanity. Modelled after ships that appeared in World War II, but possessing weaponry far superior to those in humanity's possession and protected by an indestructible barrier immune to whatever we have to throw at them, humanity quickly loses control of the seas and our military forces are annihilated in the desperate battles against them. The result was a world where humanity's presence in the oceans is no more, with communication via the seas cut off and humans isolated from each other, blockaded by the "Fleet of Fog". In 2054, a change became across the Fleet of Fog. The ships of the Fog, impersonal and faceless, started developing "Mental Models", human avatars capable of thinking in ways similar to human beings, with personalities unique to each Mental Model. One of these was the I-401, or, Iona, who made contact with Gunzō Chihaya to become his ship. Gunzō, with Iona and a small band of friends who now crew the I-401, as Blue Steel now seek to create a balance to this lopsided status quo with the Fleet of Fog, to bring a peace where humanity and the Fleet of Fog can happily coexist together. Ashigara is one of Hiei’s subordinates, and Myōkō’s younger sister. Her Mental Model takes the form of a teenage girl with long straight black hair and dark red eyes, with her face framed by a fringe and two long locks that end in a spiral. She wears a "school uniform", along with her sisters and Hiei’s. As an individual, she seems very immature. Often, she gets so excited that she is about to do battle that she forgets to prepare properly. She happily jumps into the fight, with little concern of tactics, positioning, or even the possibility of hitting a fellow classmate. In one instance, she even forgot to prepare the ship before diving underwater to chase after the I-401. Her decks flooded with water, but she was so fixated on hunting the I-401 that it didn't matter. It is very fortunate that the Fleet of Fog ships do not have human crew! She was forced to ask for assistance from her classmate Nachi, who attempted to provide aid. Unfortunately, I-401 managed to escape this particular encounter, and the two Mental Models ended up looking like fools. In the manga, Ashigara sacrifices herself to defend her flagship, Kongō. Eventually, she finds herself on the I-401 and must make a decision. Side with Iona or Kongō? In the Ars Nova Cadenza movie, she along with her sisters pursued 1-401 and Blue Steel to prevent them from interfering with Musashi’s plans. Ashigara engaged Takao along with Haguro as I-401 tried to break through the Bering Straits and into the Arctic to confront Musashi. Ashigara in drydock at Singapore, December 1942. This page was last modified on 29 June 2018, at 13:42.